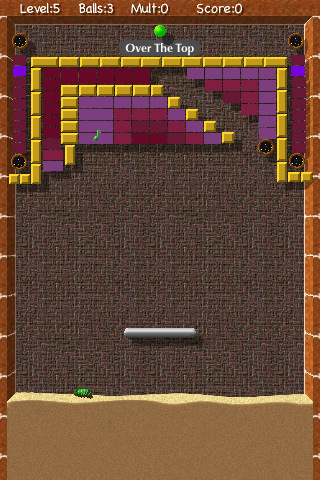 MacBrickout is a free iPhone app from Carson Whitsett featuring classic 2D paddle and ball gameplay that will instantly take you back to the 80s. You play with one finger placed on the bottom of the screen to move the paddle left and right. Lifting your finger up at anytime pauses the game, which is nice for when you need to take a break. This game uses creative ways to continuously give you incentive and keep you excited. 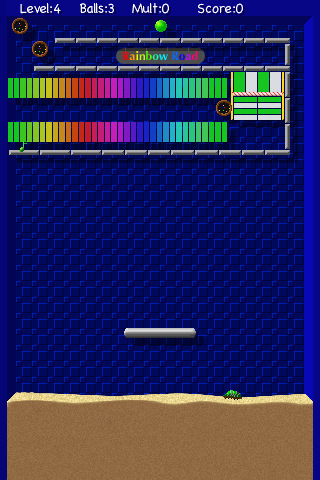 The bitmap style graphics in MacBrickout are super retro and colorful, reminiscent of something out of an old arcade. Gameplay is smooth and gets pretty fast at times. There are lots of bonus balls, pills, bubbles and hidden triggers. You have a mission to accomplish in the levels. For example you’ll have to hit a series switches and turn them off. Using radiation balls you can cut into bricks. There are also bomb balls which you can set off by lifting your finger at the right time and blow things up. Each level gives you 3 lives, although multi-balls and extra balls are all over the place. There’s a little creature in the sand on the bottom of the screen that will pick up dead balls and throw them back into play for you. You’ll get a special treasure each time you finish a bonus level, plus there are all sorts of hidden things like fruits to unlock in the levels. Options let you set skill level, and pick from 3 different soundtracks. You can change the paddle tracking from absolute to relative. AppSafari review of MacBrickout was written by Joe Seifi on February 24th, 2011 and categorized under App Store, Arcade, Free, Fun, Games. Page viewed 5280 times, 1 so far today. Need help on using these apps? Please read the Help Page. Great game! The full version is lots of fun! Excellent app for family fun…you’ll enjoy it! I LOVE THIS GAME. IT IS ON MY TOP FIVE FOR MY FAVORITE APPS! Get the game and find out how the “Umphee” (cute little bug crawling in the sand) can be your best friend.